For convenience, if your time in Sicily is limited, names of our "Top 12" places to visit are in Italics and marked with a red dot (•). For greater detail than the maps on this page, see our large interactive map of Sicily, which also has links to localities and sites. And don't forget the scenery and geography page which describes the landscapes by region. 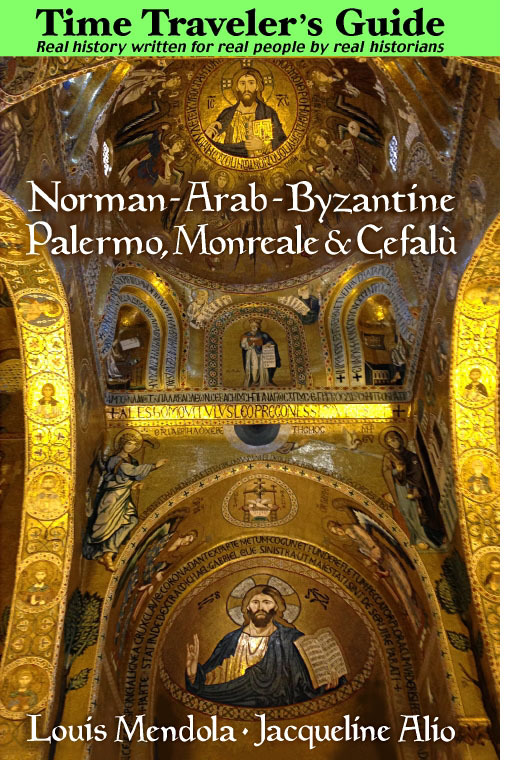 About This Index: Listed above are the names of cities, towns or geographic regions (such as Mount Etna) throughout Sicily which have sights or monuments of particular natural, historical or archeological interest, and they're also indicated on the map. Also mentioned are a few localities which, though not inhabited today, are identified with ancient or medieval settlements, such as Solunto. 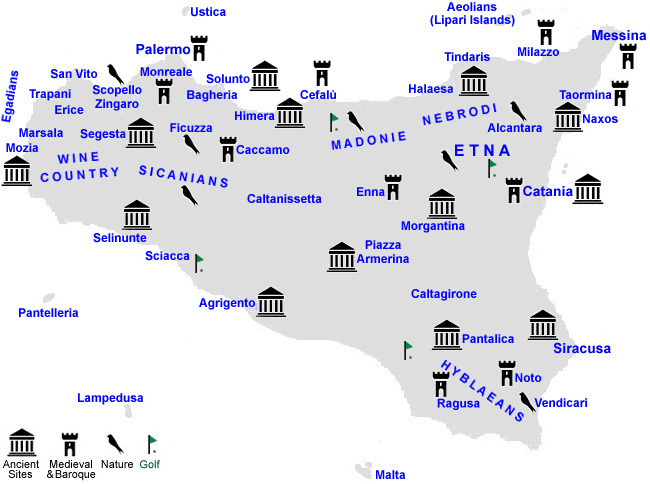 The Sights to See page indicates additional archeological sites (and has a map showing where these are), as well as nature reserves around Sicily. It's a good page to consult if you're searching for a certain kind of place or experience, but don't know exactly where to find it. Things to do are also indicated there: beaches, golf, children's activities. The road map of Sicily provides a more detailed view of Sicily. Other localities (Gela, Castelbuono, etc.) and regions (the Nebrodi and Madonie mountains, to name just two) are occasionally mentioned in connection with articles published in our online magazine or may be found by searching this site. The wine page includes a list of wines produced in Sicily based on viticultural regions (denomination of origin) corresponding to geographic features or localities, and the Palermo page identifies districts of that large city, with info on our Palermo destination guide. We cannot respond to emails inquiring about specific localities in Sicily. For detailed information about specific, small cities and towns try a search engine search on Google using the name of the town and country, for example Mistretta+Italy. The events page lists annual events around Sicily.